Today is the release date for Wave 6, so let's discuss the commander that everyone is actually talking about! It's time for General Organa again! Just kidding, it's really Admiral Sloane. While a friendly squadron without Rogue is attacking, it may spend 1 die with an Accuracy icon to choose and spend 1 of the defender's defense tokens. While attacking a ship, it may also reroll 1 die with a Critical icon. A commander that actually helps squadrons out? And Imperial squadrons at that! All for the price of Motti, so cheap as hell. 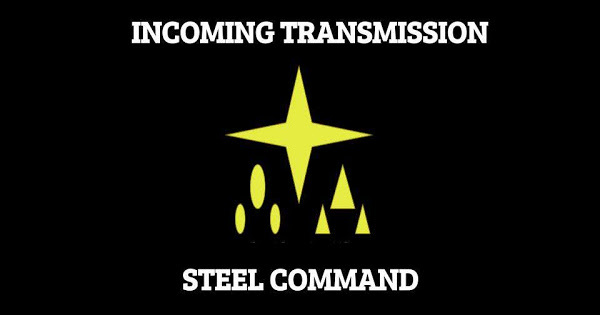 That alone was enough to have her declared part of the "Pantheon of Good Imperial Commanders" before she is even released (along side Motti, Jerry, and your personal favorite dice manipulating commander). A quick point for rule interactions that seem to affect her (until the eventual FAQ). So, who benefits from Sloane, and how much? Looking over our Imperial squadron list, you can already rule out quite a few squadrons who have Rogue: Aggressors, Firesprays, Decimators, and YV-666s. TIE Bombers also get no help at all - they can't roll Accuracy results (Major Rhymer the only exception, against squadrons) and they really, really don't want to reroll their Criticals against ships. Other squadrons get a bonus against just anti-squadron shots, or just anti-ship shots. Anti-squadron specific boosts include the following: Dengar and the TIE Advanced (Zetrik Strom rolling a 1/8 accuracy on each die getting the smallest boost). Darth Vader gets an interesting benefit here for anti-squadron, as now EVERY die face on his Blue dice are useful against Ace squadrons. Well, as long as only one rolls an accuracy. But still, the Dark Lord of the Sith got even more scary for killing off named squadrons. Dengar the Disintegrater boosts anti-squadron as well, by giving everyone the Counter keyword. For anti-ship shooting, the generic Lambda Shuttle just gets a boost, having a Blue anti-ship armament and only Black dice for anti-squadron. Col. Jendon is a special case, and doesn't really fit here. Still more squadrons aren't really... helped as much by Sloane. TIE Defenders, for example, look like they would love this upgrade. Now every roll against a ship is doing something! 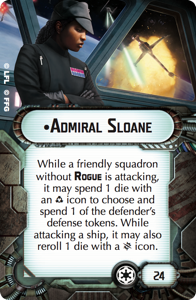 But they only have 2 Blue dice against squadrons, and as Bombers they don't get the reroll benefit from Sloane unless you are using them to fish for Accuracy results to spend defense tokens. If you are doing that Maarek Steele can do some funny things with Sloane and dice manipulation timing, making him an exception to the TIE Defender mini-buff. Flip a die to a Critical result with Steele's ability, then reroll it with Sloane to fish for an Accuracy result! With effectively 3 chances to hit an Accuracy, and no way to not do at least 1 damage, he's literally the best bang for your buck anti-ship with Sloane. That brings us to the big winners: TIE Fighters, TIE Interceptors, TIE Phantoms, and... the generic Jumpmaster5000! Well, it doesn't make the Jumpmaster good enough to take without using it for its Intel keyword, but the squadron does have 2 Blues anti-squadron Swarm dice and 1 Blue anti-ship, so an interesting consideration. jbrandmeyer was nice enough to crunch some numbers and start a good discussion for us all on the merits of the TIE Fighter vs the TIE Phantom post-Sloane. Suffice it to say, each one can find a good spot in a Sloane list, depending on what you need. TIE Interceptors continue to live in an odd place - but Sloane does buff up their Counter attacks as well, and the named ones definitely deserve a second or third look. But what ships does Sloane like? Well, the answer is ships that the opportunity cost for not taking Motti or Jerry isn't too high, and has enough Squadron value to keep her large fighter force committed. The Quasar is an obvious choice, giving her better squadron pushing abilities to hopefully dominate the squadron game quickly and turn on the enemy ships faster. The ISD is another good option, as it has enough navigation and hull that Motti and Jerry aren't completely necessary to use it effectively. Obviously, the Gozanti is going to get some looks, as it is still the cheapest way to push squadrons for the Imperials, though the Quasar has quantity of squadrons to push. The Raider and Gladiator are somewhat agnostic to Sloane, while the Arquitens Command variant could be an option though it really wants Jerry's extra clicks at high speed. The Interdictor and Victory are probably the worst ships for her - the Interdictor doesn't really push squadrons, and while the VSD can, it also wants Jerry's maneuverability. All told, Sloane definitely brings the TIE Swarm back as a possibility for Imperial fighter cover. It'll be interesting to see where she find success within the Imperial Pantheon. Start thinking about how to use her or worry about how you'll beat her now, because she's out today! Got a game in with Sloane last night, using and ISD Avenger. Pretty nasty against big ships that rely on the Brace token. I think threat overload is probably the way to deal with her - make sure those TIEs have other targets the round that your ships get into engagement range, to force a split of their fire. Raiders. Raiders everywhere. Double black flak tears her apart. standard flak is a good answer to Ties. I think the Ryhmer nerf was to prevent Ties from setting in the Stronghold bubble and bombing from blue range with flak impunity. Gunnery teams and a dedicated effort to lay down sustained flak screens will can keep her in check though. Great commander for Imperials but not a game breaker by any means. Glad to see the addition to the game.